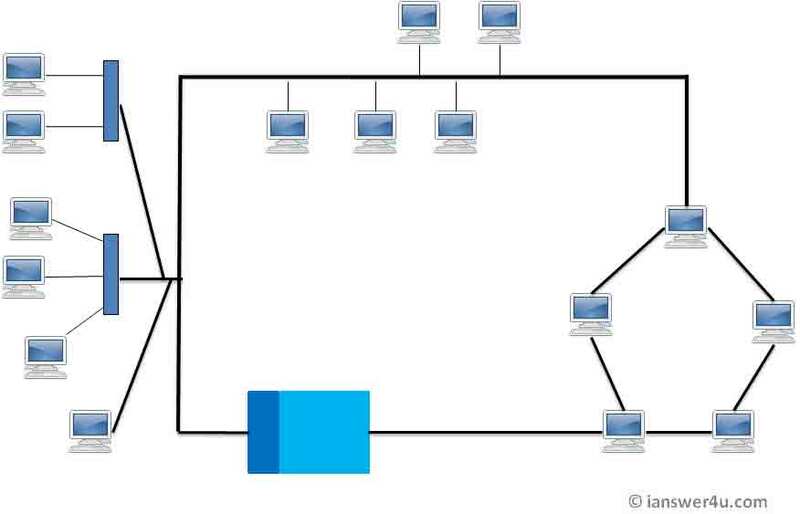 What is Hybrid Topology ? Before starting about Hybrid topology, we saw that a network topology is a connection of various links and nodes, communicating with each other for transfer of data. We also saw various advantages and disadvantages of Star, Bus, Ring, Mesh and Tree topologies. Now lets discuss what Hybrid Network topology is and why it finds its application in Wide Area Networks. Hybrid, as the name suggests, is mixture of two different things. Similarly in this type of topology we integrate two or more different topologies to form a resultant topology which has good points(as well as weaknesses) of all the constituent basic topologies rather than having characteristics of one specific topology. 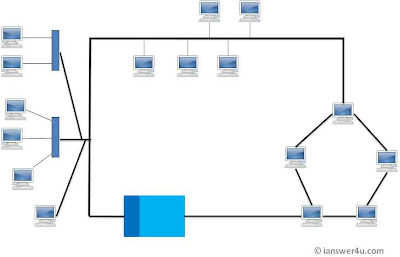 This combination of topologies is done according to the requirements of the organization. For example, if there exists a ring topology in one office department while a bus topology in another department, connecting these two will result in Hybrid topology. Remember connecting two similar topologies cannot be termed as Hybrid topology. Star-Ring and Star-Bus networks are most common examples of hybrid network. 1) Reliable : Unlike other networks, fault detection and troubleshooting is easy in this type of topology. The part in which fault is detected can be isolated from the rest of network and required corrective measures can be taken, WITHOUT affecting the functioning of rest of the network. 2) Scalable: Its easy to increase the size of network by adding new components, without disturbing existing architecture. 3) Flexible: Hybrid Network can be designed according to the requirements of the organization and by optimizing the available resources. Special care can be given to nodes where traffic is high as well as where chances of fault are high. 4) Effective: Hybrid topology is the combination of two or more topologies, so we can design it in such a way that strengths of constituent topologies are maximized while there weaknesses are neutralized. For example we saw Ring Topology has good data reliability (achieved by use of tokens) and Star topology has high tolerance capability (as each node is not directly connected to other but through central device), so these two can be used effectively in hybrid star-ring topology. 1) Complexity of Design: One of the biggest drawback of hybrid topology is its design. Its not easy to design this type of architecture and its a tough job for designers. Configuration and installation process needs to be very efficient. 2) Costly Hub: The hubs used to connect two distinct networks, are very expensive. These hubs are different from usual hubs as they need to be intelligent enough to work with different architectures and should be function even if a part of network is down. 3) Costly Infrastructure: As hybrid architectures are usually larger in scale, they require a lot of cables, cooling systems, sophisticate network devices, etc. nice job mate.............helped me alotTTTT!!!!! permission to cite this on my homework pls?